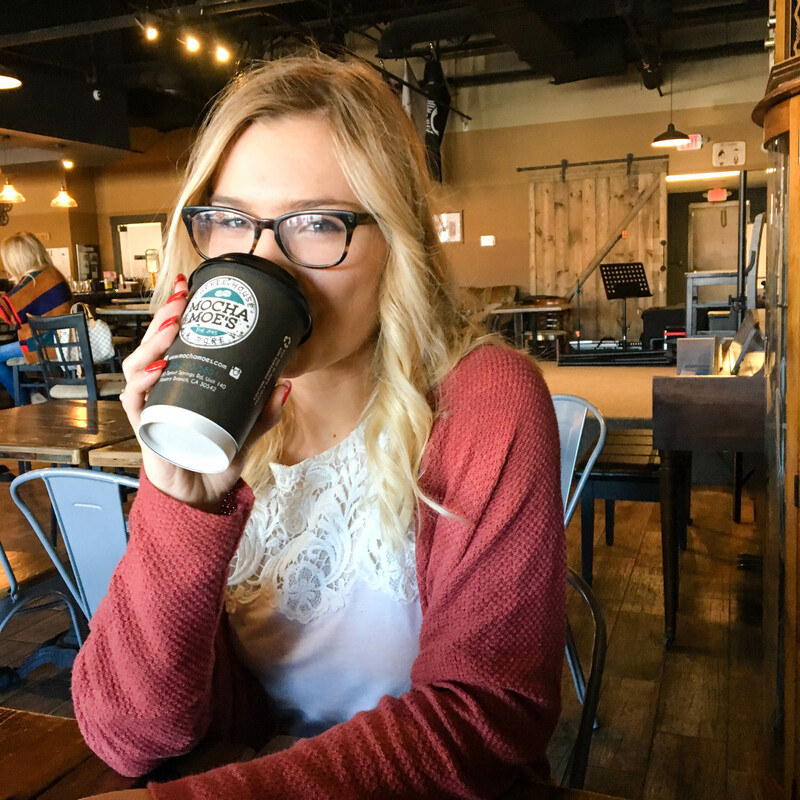 I spend approximately 80% of my waking hours running around from place to place – whether it be class, work, Pure Barre, club meetings, or just holing up in a coffee shop in hopes of boosting my productivity. I aim to eat actual meals at breakfast, lunch, and dinner times, but sometimes my schedule doesn’t let this happen. With this much of an on-the-go lifestyle, it’s important that I’m stocked up on healthy snack foods that can get me through the day and keep me full when I don’t have time to sit down for a full meal. In today’s post, I’m sharing some of my favorite snacks that are, for the most part, pretty healthy. I’m still not entirely sure these are healthy – they taste way too good. They’re made up of six ingredients – almonds, dates, chocolate chips, cocoa powder, coconut flour, and sea salt – but they feel more like you’re eating some fancy truffle. I’ll usually keep a bag of these in my backpack for whenever I realize I may need a little something to get me through class or work. I talked about these in my July favorites, and I’m still hooked on them. They’re a fabulous meal substitute, as they’ve got a healthy balance of carbs, fat, and protein. They’re also vegan and keep me full for hours. What more could you ask for, really? Carrots and ranch used to be my go-to, but when I was in Oxford, those little packs of carrots always seemed to come with hummus rather than ranch dressing. I think being forced to eat my carrots this way made me prefer it. I have a soft spot for Trader Joe’s roasted garlic hummus, so putting these two together is an A+ snack for me. These play double duty as either a breakfast option or a snack. I love how easy they are to make (literally just add milk and let sit in the fridge for at least 6 hours), and the flavors themselves are fabulous. The Blueberry Banana & Vanilla Bliss is my favorite hands-down, but I’ve tried two of the other flavors and liked both of them as well. If I’m in the mood for a little candy, these are always what I grab. They’re less processed than Reese’s peanut butter cups, and I’m more of a dark chocolate gal than a milk chocolate gal anyways. I usually pick up a bag of these at the start of the week and throw in one or two with my lunches. So that’s what I’ve been snacking on lately! 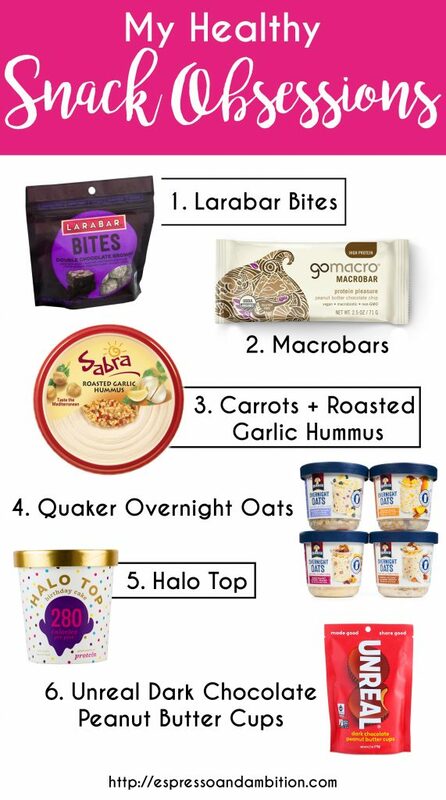 All of my grocery shopping is done at either Trader Joe’s or Kroger, so you shouldn’t have any trouble finding any of these. Anyone got any other yummy snacks I should add to my repertoire? OMG! I feel you with the hummus and carrots obsession. I can sit down in front of my laptop and just munch of that forever.